As a superhero junkie, you can spend your days now picking your side in the Civil War. You can start imagining the furniture situation in the Hall of Justice. You may even be really into Shazam. Not I. In a world where not even that terrible Green Lantern movie can kill the next Green Lantern movie, there is only one comic-book project I'm eagerly awaiting these days, and it's a well-timed counterpoint to the glut of convoluted masked-man backstories. Assembly-line entertainment, you face the Tick! Yes, Amazon last month quietly announced it was reviving The Tick, an independent 1980s comic turned cult-y 1990s Saturday morning cartoon turned short-lived 2001 live-action TV show. It will get at least a single pilot episode, pending whatever crowd-sourced criteria the streaming service uses to judge its nascent entertainment properties. Creator Ben Edlund, who has spent the last decade writing and producing for Firefly, Supernatural, Gotham, and the like, will return to lead the once again live-action show, joined by actor and professional square-jawed doofus Patrick Warburton, who will squeeze back into the buffed-up blue suit. It's an odd choice, but a welcome return as we continue to be pummeled with the twin Hulk Hands of comic-book-character houses. On one bloody-knuckled hand is DC with its muted color palette and its dour commitment to portraying the superhero racket as hard, soul-straining work. On the other hand, proudly clad in its Infinity Gauntlet, is the Marvel machine, cranking out its glossy widgets with splashes of welcome humor, but enough corporate-mandated mythology that makes watching all this stuff feel at times like homework, not entertainment. Sit out Thor: The Dark World or miss an episode of Agents of S.H.I.E.L.D. and risk falling behind the class; even this summer's delightful Guardians of the Galaxy sags when forced to shift into expository corporate-spiel mode. 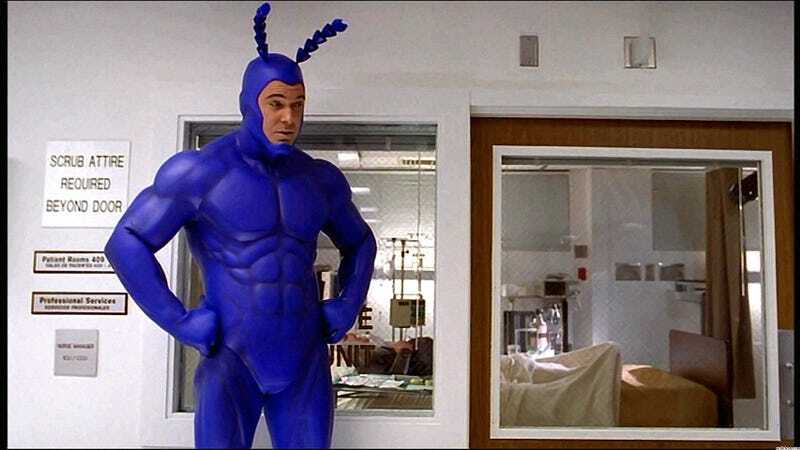 Re-enter The Tick: The Big Blue Bug of Justice isn't the hero we deserve, but he is the one we need. Details are sparse about this new iteration, but you don't need details to enjoy the Tick, and therein lies his genius. Edlund cares little for oft-tedious genre touchstones like origin, motivation, and mythology: Hell, the city this particular superhero has sworn to protect is simply called The City. The Tick just is. There is no alternate identity. No dead parents. No radioactive bug bite. No contrived "dark" tone. There is only a thirst for justice, a puppy-dog-like affection for his colleagues, and a knack for unintentional destruction. Just like Zack Snyder's Metropolis-decimating Man of Steel, the Tick may save the day, but a few buildings will topple in the process. But at least Edlund appreciates the ridiculousness of it all. Which is great: In whatever form, The Tick has always has always spoofed the more serious, self-absorbed characters in the comic-book universe. Its meta-critiques are every bit as incisive as anything in Watchmen; they just often happens to be voiced by Arthur, a meek accountant turned wannabe superhero in a moth suit. The ensemble is a motley group of dysfunctional heroes of varying degrees of competence who are all more Seinfeld than Spider-Man, chatting about the banalities of life and work at the corner restaurant. If there is an entertainment god, the now much more recognizable Nestor Carbonell—who you may recall as LOST's Richard Alpert, he of the dark, soulful eyes — will find time to return to the role of Batmanuel, a lothario spin on Batman fond of speaking in third person (a clear forefather to Arnett's self-obsessed Lego iteration). As for the '90s cartoon (apparently unavailable through streaming, alas), the freedom of animation allowed Edlund to create a broader and quirkier cast of heroes and villains. (Personal favorite: Chairface Chippendale, a dapper gangster whose head is literally a chair. They don't even give him eyes or a mouth.) Its absurdist sense of humor made the show a clear forerunner to today's Adult Swim zaniness; live action limits that menagerie (Chairface would be tough to pull off with CGI alone), but not the spirit. The Tick isn't just good for these times, though—the times will be good for it. A common knock on the live-action show is that the effects and sets, which were almost embarrassingly cheap-looking even at the time, look far more so now; modern technology should help sand off those rough edges. (Though a certain rough/cheap/half-assed look can be useful, if parody is part of your game.) But the benefits shouldn't just be visual: The past decade has provided Edlund with plenty of joke material, from the Nolan Batman trilogy to the dead-serious Watchmen movie. We've got plenty of superheroes who need to be taken down a peg or two; what the world needs now is more jokes and less backstory. We know just the, uh, guy. Dan Eaton says "actually" way too often, has an unreasonable love of Arby's roast beef, and watches just the right amount of TV and movies without jeopardizing his marriage. He writes about other things for other people, but they don't let him swear. The Concourse is Deadspin's home for culture/food/whatever coverage. Follow us on Twitter@DSconcourse.